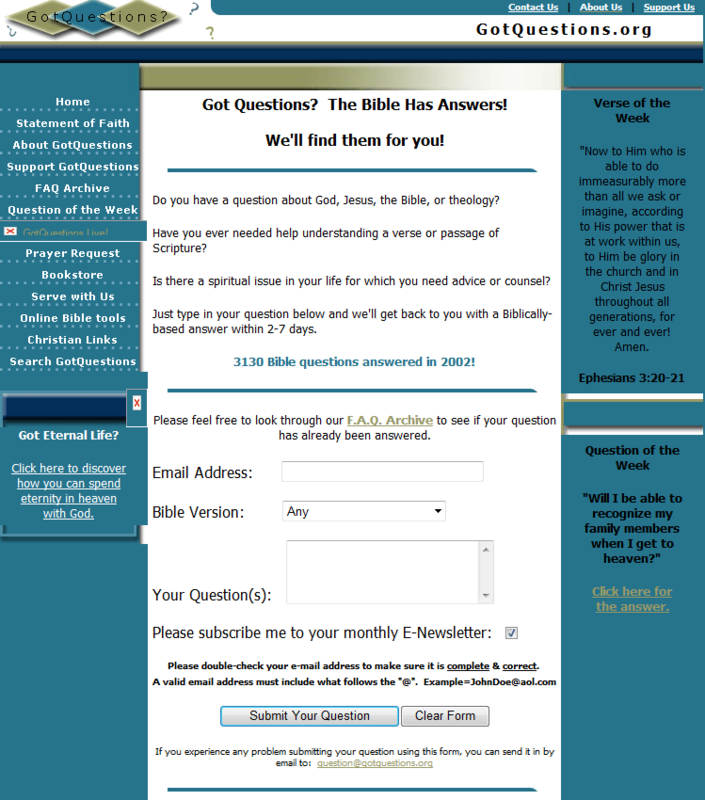 GotQuestions.org was started in February of 2002. In late 2001, God gave our founder, S. Michael Houdmann, a passion for helping people find answers to their Bible questions through the internet. 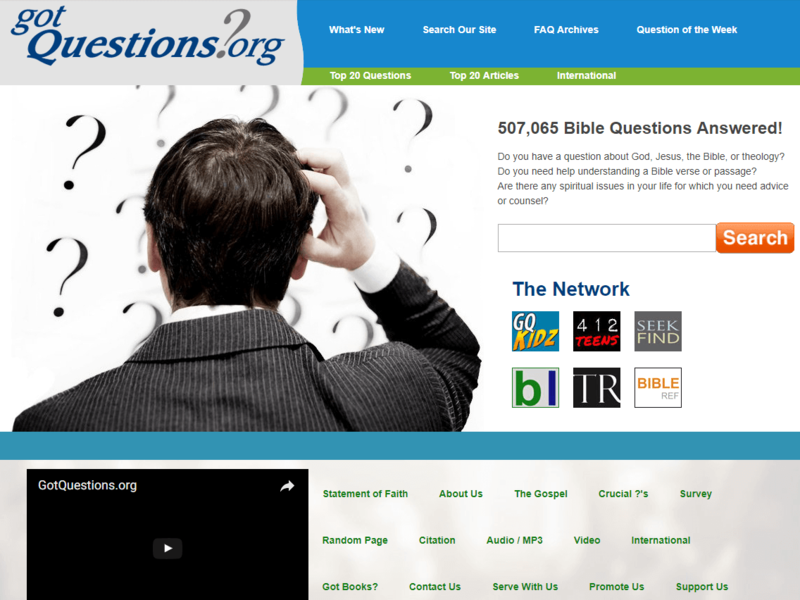 Little did he envision how quickly God would turn GotQuestions.org into a full-time ministry. 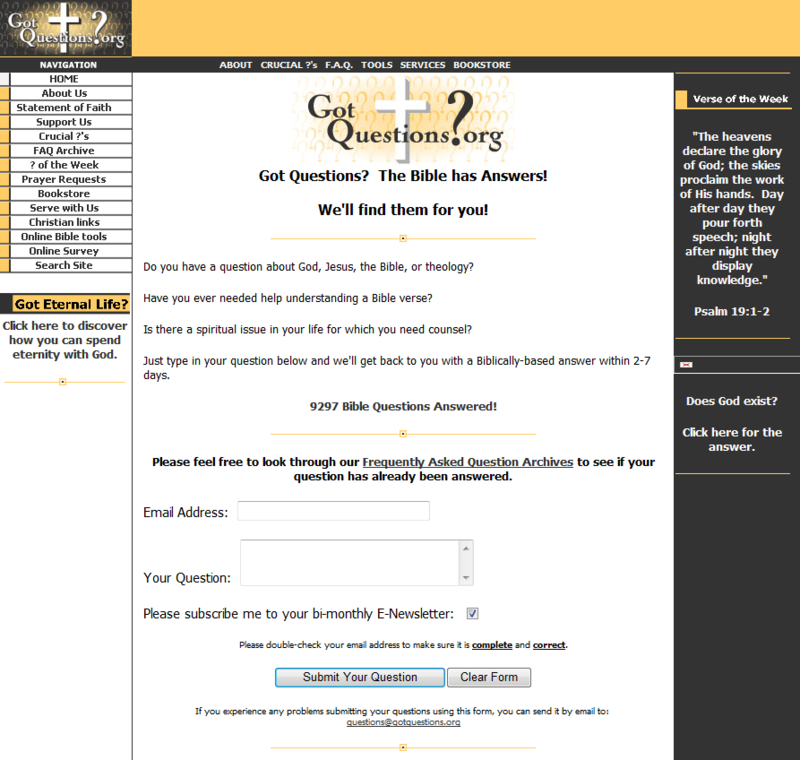 He quickly discovered what a great need there was for a quality Bible answer service on the internet. Within one month of our launch, GotQuestions.org was receiving over 30 questions a day. We quickly recognized our need for help, so we began searching for volunteers to assist us in answering all of the questions we were receiving. The volunteer staff grew steadily, ultimately to our current team of over 250. At the same time, the volume of questions steadily increased. We are currently averaging 125 questions per day. We continue to praise the Lord for our volunteer writers. They are what makes this ministry possible! As our website traffic increased and the volume of questions continued to grow, we recognized the need to have our most frequently asked questions and answers posted online for easy and instant access. We currently have over 6,100 of our most frequently asked questions posted online in our archives. Now, the vast majority of GotQuestions.org's visitors find their answers in the online archives rather than by submitting a question to us. In May of 2002, we started posting a question of the week online and immediately received requests for it to be sent out via email as well. Our Question of the Week email now has approximately 330,000 subscribers. So, we began to pray, how can we prevent people from visiting these unbiblical sites? In response to our prayers, God led us to search engine optimization. By designing our webpages to be search engine friendly, we achieve good rankings in the search engines. If anyone searches for anything Christian or Bible related, we want to be there near the top of the search engine results. We strive to be listed higher than the sites that do not proclaim the truth. God has blessed our efforts, as we knew He would (Philippians 4:19). The vast majority of our approximately 12,000,000 monthly visitors find us through the search engines. In November of 2005, we began the process of translating what we believe to be our most important webpages into other languages. It is our goal to translate our fifty "most important" articles into every major world language. Beyond that, it is our goal to translate at least 200 webpages into all of the world languages that are most prominent on the internet. There are, sadly, many languages which have very little quality Christian content available online. Our articles have now been translated into 167 languages, with a total of 47,500 pages of translated content. In order to expand our impact, we have launched several other websites focused on different audiences. 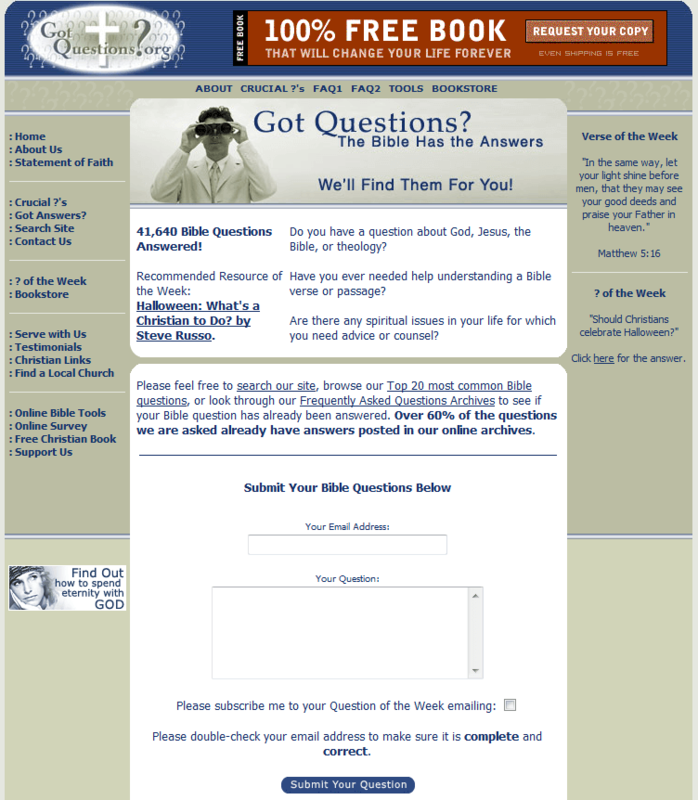 We launched our Christian research search engine - www.seekfind.org - in 2005. We launched our site for kids - www.gqkidz.org - in 2007. 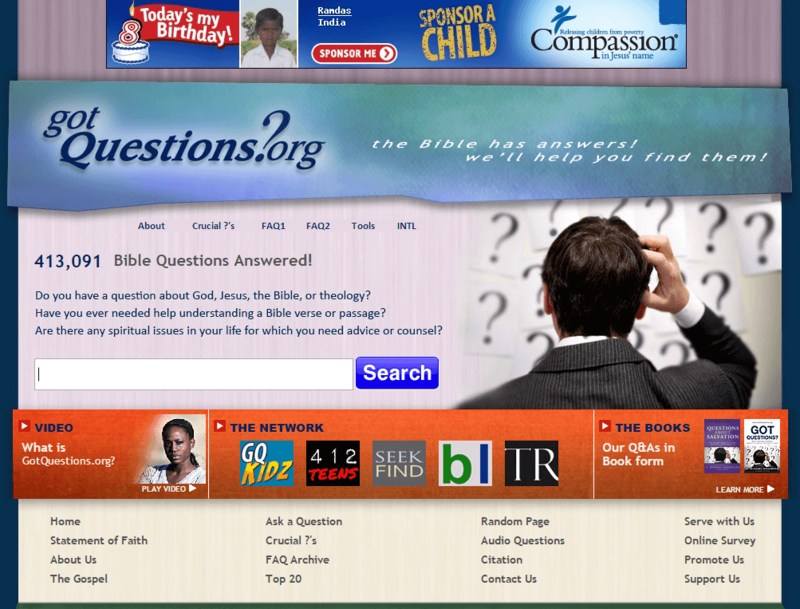 We launched our apologetics and worldview focused site - www.compellingtruth.org - and our blog site - www.blogos.org - in 2011. We launched our site for teens - www.412teens.org - in 2012. We launched our Bible Commentary site - www.BibleRef.com - in 2016. We continue to pray and dream regarding how God would expand and improve the ministry of GotQuestions.org! We praise the Lord for what He has accomplished through us and in us! 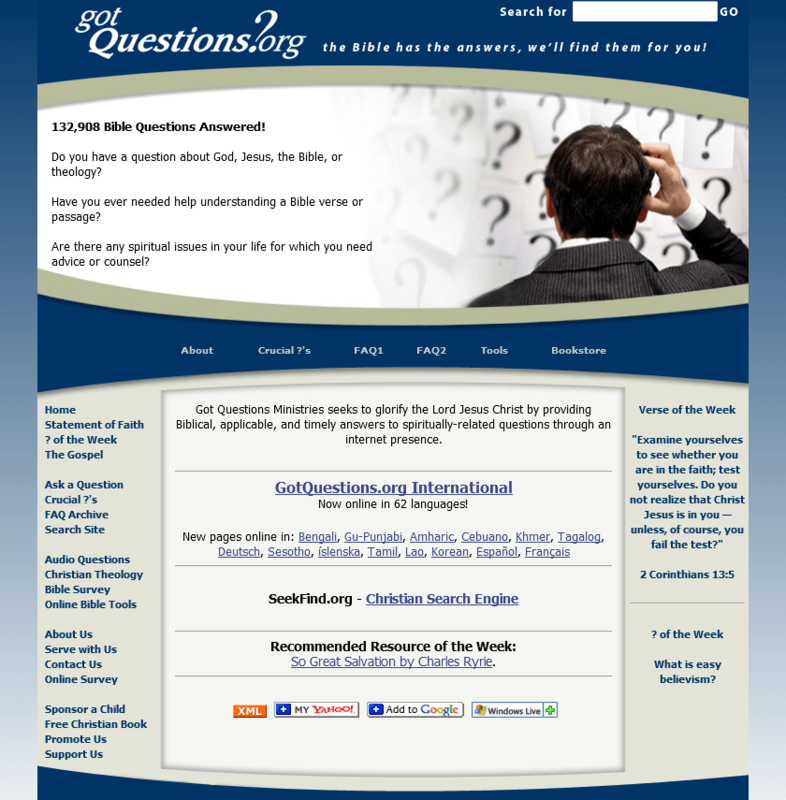 We look forward for how God will use GotQuestions.org in the future.